As we gear up for the Spring season, proper care of your HVAC system is important to ensure your AC unit is running efficiently which will help you maintain and achieve additional energy savings this summer. Here are four energy saving tips that you can do in your home this Spring. Tip 1: Change Your Filters Monthly: Clogged and dirty filters block normal airflow. This is the most important maintenance task to help you ensure the efficiency of your unit and can lower your energy consumption by 15%. Tip 2: Clean Your Vents: Debris and dust make your AC system work hard which costs you more money. 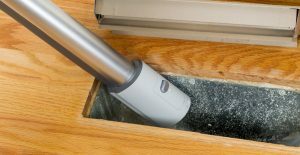 We recommend cleaning them which can be done by 1) Vacuuming the vents – use the crevice extension to get into the vent slots. 2) Wash the vents – remove the vent cover and wash with dish soap. 3) Cobweb Duster: get into the vent with the duster as far as you can to get a thorough cleaning. Tip 3: Clean Condenser Coils: When you clean the condenser coils you can lower your AC energy consumption by as much as 30%. To clean, remove visible grass and dust using something like a whiskbroom. Then spray coil cleaner into the coils and wait 5 to 10 minutes. Lastly, gently rinse the coils with water to avoid bending the fins. Tip 4: Clear the Plants, but Keep the Shade: let your air conditioner breathe by clearing away any plants that can block the air flow and make your AC work harder. If possible, keep your AC unit shaded. This can save you 10% on electricity. If you have questions or concerns about AC maintenance, we’re here to help. Contact us today to schedule an appointment with one of our certified specialists, as we are certified to help! Cheers to an early Spring in 2018!